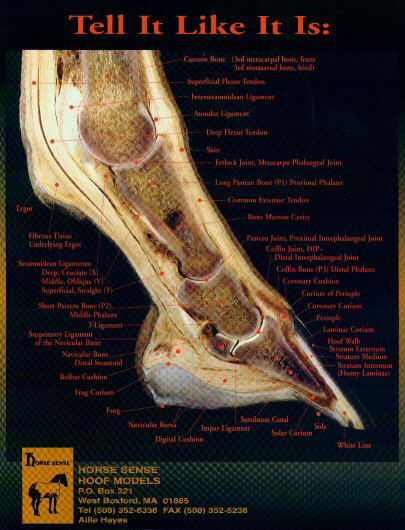 << Back Equine Anatomy Chart, Normal Hoof - Tell it like it is. This is a condensed view of our anatomy chart of the normal foot. The actual chart has much more detail, because it is printed at a resolution of 1000 dots-per-inch. The resolution of the image on your screen is only about 72 dpi at best. You can click on the image to see an expanded view. The actual 8 1/2 by 11 is much clearer than this, and is laminated in plastic.